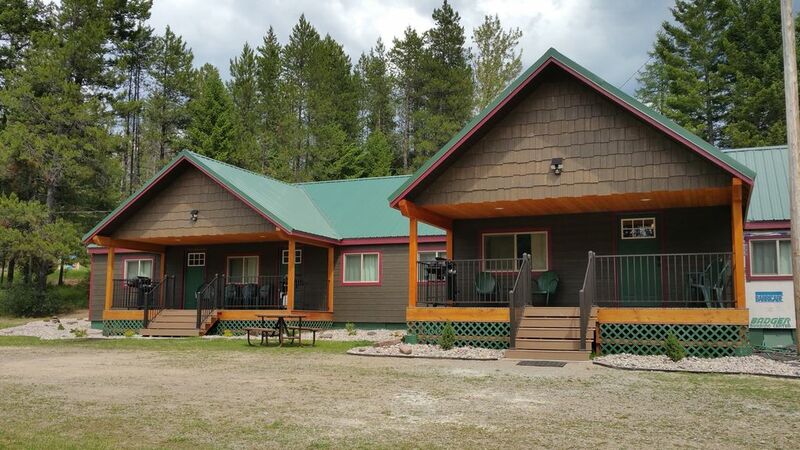 Willkommen im Moose Creek Townhouse in Lazy Bear Lodging! Kommen Sie und entspannen Sie sich in den Rocky Mountains in der Stadt Hungry Horse. Unsere Stadthäuser befinden sich 16 km vom westlichen Eingang des Glacier National Park entfernt und befinden sich im nördlichen Teil des Flathead Valley. Unser Gebäude befindet sich auf 1. 5 Hektar und grenzt an das Forest Service-Grundstück. Sie finden 2 Queensize-Betten, 1 Badezimmer, eine voll ausgestattete Küche und ein gemütliches Wohnzimmer. Das Wohnzimmer verfügt über einen 55-Zoll-Smart-TV sowie einen Blu-ray- / DVD-Player und ein DISH-Kabel. Alle Handtücher und Bettwäsche werden für Ihren Aufenthalt bereitgestellt. Die Küche umfasst alle Gerichte, Töpfe und Pfannen, Messbecher / Löffel und Backformen. Wir verfügen über 2 weitere Reihenhäuser, die sich auf unserem Grundstück befinden und für Ihren Aufenthalt reserviert werden können. Angeschlossene Stadthauseinheiten: Forelle Run-VRBO # 694575 und The Bear Den-VRBO # 716506. Great Rental! Well stocked, well maintained, and great location! This cabin is awesome and feels like home not a rental. Owners have put a great deal of time and effort into making sure the cabin is in top notch shape. This is the one and only place we have ever stayed when at Glacier NP. We have stayed here on two seperate trips now and wouldn't even consider staying anywhere else. And y'all shouldn't either. Just book it! Great location, really cute little cabin with amenities for cooking/grilling. Newly renovated property decorated in Montana cabin motif. Great beds and shower. Fully stocked, new, kitchen. Even had coffee and filters. The welcome gift of huckleberry jam was special and enjoyed all week. Location was convenient to West Glacier and Columbia Falls. This is a nicely appointed and comfortable unit. We had a pleasant stay here. The beds are so comfortable and the water pressure in the shower is great. Everything you need in the kitchen. My only criticism is I feel the $150 cleaning fee is excessive for the size of the unit. We rent a 7 bedroom house in the Poconos and pay a $200 cleaning fee. You may have us confused with the place you stayed at in East Glacier. We don't charge our guests a cleaning fee. It was a pleasure chatting with you and your friend. We enjoyed staying here for three nights and found much to like here. I don't know whether the owners stay here themselves, but the cabin was set up much like I'd set it up if I owned it myself. While we didn't cook, the kitchen seemed quite complete. I was pleasantly surprised to find a canister full of good-tasting coffee (not just a token amount to get one started) and there were little details like a small ice chest available to use if needed for day trips. The decor was nice with a western/mountain theme. Nice place, clean with homey touches. Liked having a separate or second bedroom for the kids. Close access to the national park and other services. Kitchen had everything we needed. Good communication with owner. Would definitely recommend it.